^ Phillpot, H. R., and J. W. Zillman (1970), The Surface Temperature Inversion over the Antarctic Continent, J. Geophys. Res., 75(21), 4161–4169. ^ 11.2.1.2 Models of thermal expansion IPCC Third Assessment Report WG1. ^ "Ice rise", English Wikipedia. ^ a b c Antarctic Temperature Trend 1982-2004 NASA Earth Observatory, April 27, 2006. ^ a b c d e An assessment and interpretation of the observed warming of West Antarctica in the austral spring, David P. Schneider, Clara Deser and Yuko Okumura, Climate Dynamics 38 (2012) 323. ^ IPCC 2007, Intergovernmental Panel on Climate Change, Climate Change 2007: The Physical Science Basis. Contribution of Working Group I to the Fourth Assessment Report of the Intergovernmental Panel on Climate Change, Cambridge University Press, 2007, page 376. D. G. Vaughan, G. J. Marshall, W. M. Connolley, J. C. King, and R. M. Mulvaney (2001). “Devil in the detail”. Science 293: 1777–1779. doi:10.1126/Science.1065116. PMID 11546858. M.J. Bentley, D.A. Hodgson, D.E. Sugden, S.J. Roberts, J.A. Smith, M.J. Leng, C. Bryant (2005). 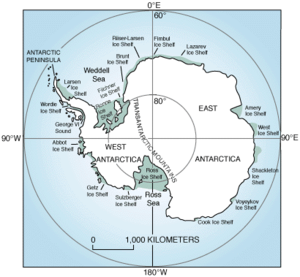 “Early Holocene retreat of the George VI 棚氷, Antarctic Peninsula”. Geology 33 (3): 173–176. doi:10.1130/G21203.1. Getting into hot water – global warming and rising sea levels Australian Academy of Science, May 2008.